Korea's Information Society: English-Teaching Robots for Korea by 2018? 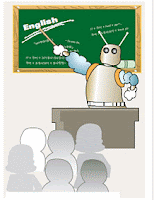 An article in today's issue of The Korea Times proclaims "Robots to Replace Native English Teachers." Participants in a recent robotics forum speculated that, by about 2015 robots should be able to help English teachers in the classroom and that by 2018 they should be able to teach on their own, while communicating with students." Robots are already available in English classes through a pilot project in Masan, aimed at testing the viability of robotic teachers. Some participants in the robotics forum also saw English -teaching robots as a remedy for the lack of English teachers in small rural farming and fishing villages. After reading this article, I remain very skeptical. Nothing is mentioned about the current state of the art in machine translation and the considerable challenges of teaching English to native speakers of Korean. The linguistic and pedagogical challenges of teaching English would seem to be too large to be overcome by developments in software and artificial intelligence in less than a decade. In any event, we'll all see.